Even at 2 years old, Papa was teaching him. 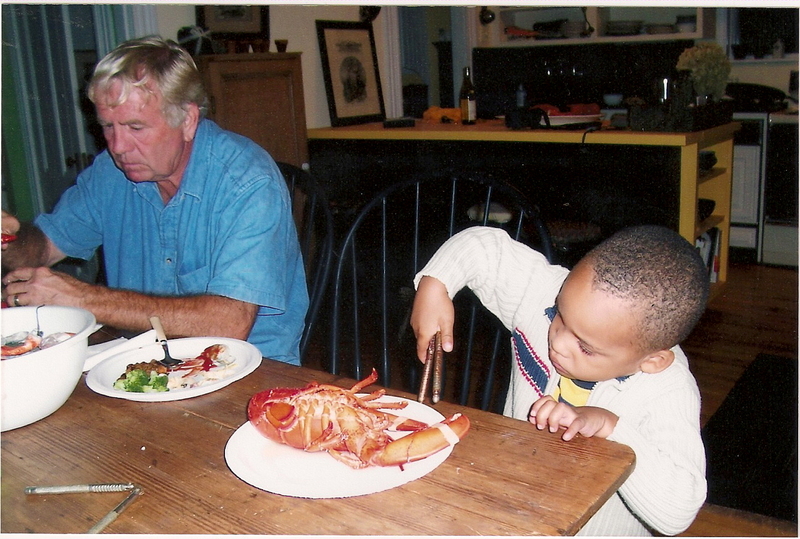 I don’t remember if he ever got that Lobster cracked open.. From then to now! Haven’t we all said at one time (or maybe I’m the only one that thought this way often) “Its innate, its in my genes to do.” Or shamefully excused actions on “oh I can’t help that, I’m a product of my environment”. When I’ve said those words it was usually to excuse some random blip of ignorance aka lack of knowledge. However, talking to so many of the locals here in my new hometown, and they compliment me on my “no holds barred” view points and ask me where I came from. I pause for a moment and reply, “Well I truly am a product of my environment(s).” Raised in Maine with a mother who was not only a teacher in the regular classroom as well as a special education teacher, and a father IN THE HOME, who instilled honest, and decent work ethics, good solid morals, and a many correct lessons about life that admittedly took for granted not realizing he was building this child’s foundation….all over again. On a recent trip to Phoenix to visit my parents (while my Dad had his last round of Chemotherapy), My Dad had a long talk with my 12-year-old son. My son I believe was probably pouring his heart into how it makes him so angry that his father chooses to not be a father and how at times he feels sad, and angry and at times feels that he is worthless trash that his father threw away. 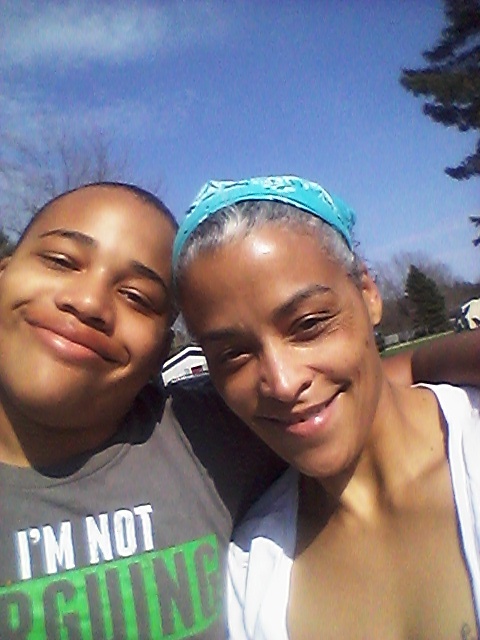 My son had succumbed to the idea that he “had his fathers DNA” his words exactly, and that he couldn’t help the rage that he carried inside of him and thought he would turn out just like him. But my Dad, my superhero, of whose DNA I have NONE of, sat Hakeem down and shared with his grandson how he was raised and how he watched his own father never work. I won’t go further into their conversation because my Dad may not want me put his father on “blast” out of respect for his family. But my father worked so hard ALL his life, eventually buying the company he worked for and growing that business and then wisely selling at the right time. I watched my Dad help a couple of his siblings many times because they may have just lacked the know how to persevere through those rough spots. I’ll never forget my Uncle Dennis. He had the biggest heart and loved people no matter what. He’s passed on now, but I still recall the smell of going to his work and how cool I thought it was as a little girl to work at that place. Never knowing the hurt he must have went through as a young boy. Well, going from AZ (48th lowest education system, to Ok 49th lowest to Michigan 12th in the education) was only a minimal portion of what happened…The exceptional educators at the 6th grade school felt we should still place him in 7th grade where he is with the understanding that he may need to repeat. Hakeem walked into that meeting with us and said “I want to come to your school because my Papa has to see me graduate”. I am proudly a product of all of my environments! they’ve shaped me to what I am becoming in this life. A butterfly is not born a butterfly is it????? It’s disgustingly gross at first, then begins yet another metamorphosis into a crawly fat still ugly thing. But that SAME ugly, useless, slimy creature at the right time in its life spins his cocoon, encapsulates itself while the miracle of transformation begins. And if you leave that cocoon alone, let him struggle his way out it may take a few days but his wings are strong and sturdy and able to withstand the wind that he will use those individually, beautiful one of a kind unique wings for, and fly away. And if you know one of their functions in life…..they pollonate flowers) and in doing so, they give back to the earth all the beauty that was given to them. Final thought: You may feel your DNA is your downfall, however something beautiful deep within you can emerge that you had no idea where it came from. My Mother and my Father placed their faith in a child that was not biologically theirs because of the Love they have within in them and they saw potential, Everyone is capable of success its a matter of channeling it and waiting until your ready to step out of your cocoon and fly! I love you Dad and Mom too, but Dad for inspiring my son in the middle of your own battle! Another beautiful and wonderfully written blog! It is so special that Hakeem’s papa was able to help him so much. He is such a sweet young man with great potential. God puts you right where you need to be…love you!